Uh oh – stuck on exactly how much you need to write in that patriotic compensation check? Better read the comprehensive feature below. This Brewery Compensation series is intended to provide guidance on the variety of compensation structures for common positions in the brewing industry. As with part 1, the information here in part 2 is designed to highlight common issues with compensation and is not a definitive guide to the specific federal and state laws that govern payment of employees and independent contractors. Therefore, always consider consulting a legal professional regarding your specific situation. The first article in the series dealt with compensation for employees working on the brewing side of operations – head brewers, brewmasters, assistant brewers and other related positions. In part 2, we will look at issues specific to the sales team. 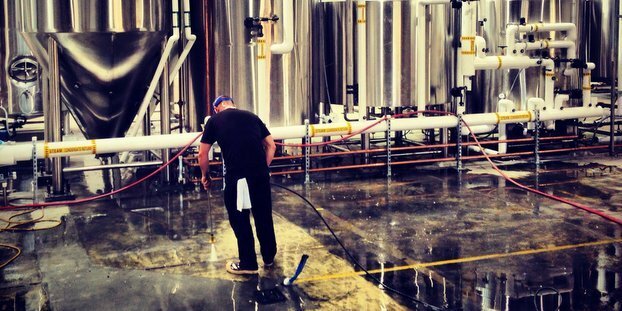 These individuals are often the first representative of your brewery in the field, responsible for developing new business and serving as the “rainmaker” for the brewery. Individuals working in the sales field tend to be outgoing and self-motivated, who are drawn to the field because of their independence and enjoyment working with people. Members of the sales team typically spend considerable time outside of the office and are often compensated based on commissions or other per-sale compensation formulas. These employees may be taking over relationships the owners have spent time building and developing and come to represent the face of the business to the outside community. As with all new hires, the first step in bringing on a new worker is to determine whether the individual will be an employee or an independent contractor. The factors for this test are covered heavily in the first article in the Brewery Compensation series. In general, because of the nature of the work, members of the sales team are going to be employees even though the employee will have considerable control over how his or her day is spent. Assuming the new worker is an employee, the next question to answer is whether the position is non-exempt or exempt. Non-exempt employees are generally paid hourly and are entitled to overtime and meal and rest breaks, while exempt employees are compensated on a salary basis and are paid at a set rate regardless of the number of hours worked. The default classification under federal and state law is non-exempt status; however, there are special exemptions in place for individuals in the sales industry that may affect employment classification. The federal Fair Labor Standards Act (FLSA) has a special exempt category for individuals involved in outside sales. To qualify for this exemption, the employee’s primary duty must be making sales (as defined in the FLSA) or obtaining orders or contracts for services or use of facilities, for which a client or customer will provide payment. Additionally, the employee must customarily and regularly work away from the employer’s place(s) of business. Because outside sales individuals are making in-person sales visits and opening new accounts within a defined territory, it can be difficult to track the specific hours worked. For that reason, these individuals can be classified as “exempt” and no overtime payment is required. The FLSA also has a special exempt category for individuals working in a retail or service establishments who are primarily paid through commissions. To qualify for this exemption, the employee must be working in retail or a service establishment — these are businesses that are primarily involved in the direct sale of goods or services to customers, rather than in manufacturing or resale activities. State laws often expand the definition of which employers are involved in the retail or service industries, but businesses that are primarily brewing and manufacturing beer likely will not be classified as a retail or service industry. Additionally, the employee must pass two salary tests. First, the regular rate of pay must exceed 1½ times the minimum wage for the state or locality. For example, in California, the 2015 minimum wage is $9 per hour, so 1½ times the minimum hourly wage would need to be at least $13.50 for a 40 hour work week to qualify. Second, the employee’s total compensation must be more than 50% commissions. If all three tests are met, the position can be classified as exempt and no overtime payment is required. Before classifying a sales role as non-exempt or exempt, review your state laws and state wage orders to determine the requirements for outside sales and commissioned sales exemptions and minimum salary requirements. There can be substantial differences between federal and state laws with respect to the payment of wages and working conditions. In order to classify a position as “exempt,” both federal and state requirements must be met. Tom T-Bone McDonough liked this on Facebook. Adrian Moser liked this on Facebook.